Dog and cat fur used for bags, toys and clothes in China. In view of the shocking investigation into slaughterhouses and dog meat markets, carried out by the animal rights organisation Animal Equality, I’ve been able to see first-hand the terrible physical and psychological torture these animals are subjected to. More than 10 millions dogs and 4 million cats are murdered each year for their meat and fur in China. The cruelty of this practice is completely unjustifiable. There are millions of us around the world who consider that the massacre of dogs and cats for human consumption or for their fur is unacceptable and I therefore urge China’s government to prohibit and eradicate this cruel trade. During my visit, I observed three workers on site. There were around 100 live dogs present on site – inside the building. Since the slaughterhouse was located inside a building and underground, we had to step down some stairs to enter. The place was extremely badly lit, and very humid. There was a serious drainage problem, and the floor was flooded from accumulated water, and water that was dripping from a tap to wash away the blood from dogs who had been stabbed. I observed some of the dogs tried to defend themselves from the workers but their efforts were invariably in vain. There was no escape. The place was surprisingly quiet, with the only noise coming from whimpering and crying dogs who were being crushed with tongs, dragged across the floor and battered to death with sticks. Some were beaten unconscious by workers who smashed sticks across their very pain-sensitive nasal area. The workers showed no signs of compassion for the animals, who were roughly handled, punched and kicked across the room before being killed. `Workers either joked, smiled or were oblivious as they dismembered still alive and breathing dogs in full view of other dying dogs amongst the mounds of bodies on the floor. I observed some of the dogs tried to defend themselves from the workers but their efforts were invariably in vain. There was no escape. At least two workers were present at any time – one grabbed the dogs from cages, the other battered and stabbed at the animals. Each victim was first caught at the throat by a metal tong clenches. If they attempted to resist, by barking or baring their teeth, one of the workers pressed the tong handles down further to tighten his grip on the animal. Another worker aimed for the nose of the dogs with a wooden stick. This man was very aware of how to do it, knowing precisely which were the most sensitive parts of the dogs’ anatomy. The dogs who were semi-conscious were then stabbed in the throat with a long knife and thrown a couple of feet to where he or she would be boiled. I observed some dogs cowering in tiny metal cages on the floor, in full view of the area where other dogs would be grabbed from the cages and killed. 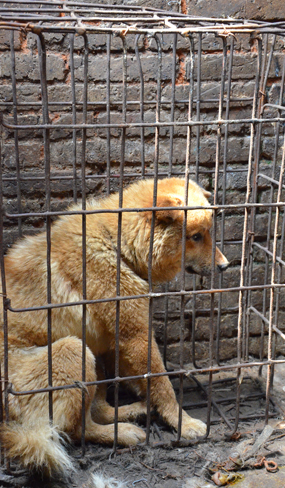 The caged dogs could also view bodies of dead dogs lying on the floor. They were forced to watch their companions die whilst they awaited the same fate. During the visit, around half the dogs were not battered unconscious immediately, and these animals were hung up whilst still thrashing around. During the visit, around half the dogs were not battered unconscious immediately, and these animals were hung up whilst still thrashing around. I still have visions of these animals thrashing around in agony whilst being hung up and stabbed. I will never forget the horror in their eyes. And there was nothing I could do to help them. All I could do was record the events so that as many people as possible can witness the fate of these animals and speak out against this abuse. These individuals were only a few of the yearly hundreds of billions victims of the meat industry, however their fear was overwhelming to me. It was clear that they wanted nothing more that to leave this hell hole. They endured what every victim of the meat industry endures: confinement, torture, and finally murder.